The Thames catchment provides drinking water to 11 million people from both groundwater and surface water, rivers and reservoirs (Howden et al., 2011). The catchment is underlain by two principal aquifers; the Jurassic limestone of the Upper Thames and the Chalk of the Middle Thames (Figure 3.1). Groundwater discharge from these aquifers forms the majority of river flows in the Thames (BFI = 0.66) (NRFA, 2014). Figure 3.1 Location and geology of the Thames catchment. In this case study we address nitrate transport in the Chalk aquifer of the Thames basin. In the Chalk, nitrate transport in the unsaturated zone occurs predominantly through the matrix by a piston flow mechanism. Unsaturated zone velocities in the chalk and limestone are considered to be approximately 1 m yr-1 respectively (Wang et al., 2012b and others). These slow velocities, in conjunction with the thick unsaturated zones present in the Chalk, result in long travel times for nitrate in the unsaturated zone. Consequently, nitrate in the saturated chalk and in groundwater discharge to the river reflects nitrate inputs to the soil zone from decades previously. Rural areas in the basin have been used intensively for agriculture and this forms the dominant source of nitrate in the catchment. The ultimate receptor in the catchment is the River Thames, with groundwater and public water supplies also being receptors. Nitrate in soils that has not been assimilated by crops reaches the river by one of two pathways. Rapid transport of nitrate in soils to rivers can occur through runoff and shallow interflow. Nitrate can also leach through the soils and unsaturated zone into the underlying aquifers, which subsequently contribute to river flows. The latter pathway exhibits a substantial lag in some cases. The Thames catchment has unique datasets for both nitrate inputs and water quality. Nitrate data for the Thames at Hampton is the longest continuous water chemistry dataset in the world, starting in 1868 (Figure 3.2). Land use, management and population data for 1861 to date are also available for the catchment. These long datasets are of considerable benefit to long-term nitrate modelling studies of the catchment. Figure 3.2 Observed and modelled nitrate concentrations in the Thames at Hampton (Howden et al., 2011). Riverflow mean daily flows at Kingston. Land use data was combined with literature leaching values and other N loading information to provide an integrated loading. Howden et al. (2010) then used a simple two reservoir transfer function to route the loading through a rapid runoff and a slow groundwater pathway. All processes were lumped together over the whole catchment due to the lack of spatial information to define inputs at a sub-basin scale over such a long period. 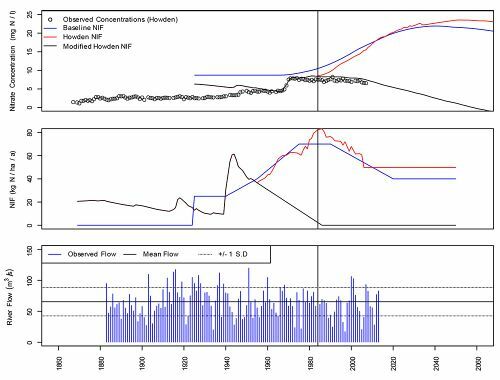 The split between runoff and groundwater was assumed to be similar to the baseflow index of the Thames as Kingston (BFI = 0.65) but this was adjusted during model calibration to approximately 0.55. A 1-D advection dispersion equation was used to attenuate nitrate loading for both the fast and slow pathways. Figure 3.2 shows observed and modelled nitrate concentrations. The model appears to replicate the observed increases in concentrations reasonably well. A 30-year lag in the groundwater component of the model was required in the calibration of the model. Consequently it was argued that the step increases in nitrate concentrations in the Thames in the 1950s and 1970s are the result of intensification of agriculture during the 1920s and 1940s (the ‘Dig for Victory’ period). Using a number of input function scenarios, it was shown that changes in basin-wide land use would take decades to be effective. Howden et al. (2011) also argued that an accurate input function is more important than a complex flow model, as demonstrated in the case of the Thames. The section Estimating nitrate transport velocity and dilution in the saturated zone of this report details the unsaturated zone nitrate transport methodology used in the BGS model. In order to subsequently route nitrate arriving at the water table to rivers, a simple saturated transport model was used. The saturated model is detailed in Estimating nitrate transport velocity and dilution in the saturated zone. Using long term average groundwater levels for the UK and river elevations, a direction and hydraulic gradient for each model cell to the river is derived. Permeability, porosity, saturated thickness, national groundwater levels and river networks are used to simulate the nitrate transport to the nearest river node. The model was used in the Thames Basin by modelling the Chalk at outcrop. 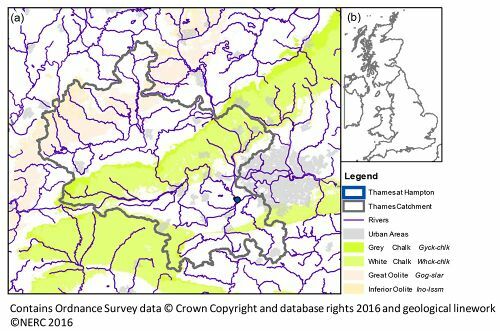 The initial model was run for the Thames catchment using the original parameters set out in Wang et al. (2016). Subsequently, a range of different parameters were used to attempt to improve the match between observed and modelled nitrate concentrations as detailed in Table 3.1 chalk aquifer permeability was increased to increase saturated transport rates. Using higher water level data from April 1975 (Lewis et al., 1993) reduces unsaturated zone travel times and increases saturated transport rates. Following modification of the model parameterisation, the nitrate input function to the model was modified. The input function used by Howden et al. (2011) was used and linearly scaled to fit the BGS NTB NIF. A further nitrate input function was derived to represent potential loss of nitrate from the catchment. This synthetic NIF was developed during model calibration as an approach to match the observed nitrate concentrations in the River Thames. Figure 3.3 shows the original NIF and the modified NIFs based on Howden et al. (2011). Table 3.1 shows the base model parameterisation and the changes made using different parameterisations and input functions. Figure 3.3 Nitrate input functions used in the application of the BGS model to the Thames basin. Figure 3.4 shows the model results for the original calibration and modifications to the parameterisation. It can be observed that the original calibration using the baseline NIF does not show any significant rises in concentration between 1940 and 1980, where the observed concentrations show two distinct increases around 1950 and 1970. Increasing the permeability of the aquifer to 200 m d-1 and increasing the groundwater levels in the model to those of April 1975 gives a relatively small improvement in the model calibration, shifting the increase in nitrate forward in time by up to 10 years. However, in overall terms the model even with changes in parameterisation struggles to replicate the magnitude and timing of observed increases in nitrate concentrations. Figure 3.4 Observed and modelled nitrate concentration in the Thames at Hampton using the BGS nitrate model with changes to the model parameterisation. Figure 3.5 shows the original model calibration and results from model runs using the nitrate input function derived by Howden et al. (2011) and the declining NIF. 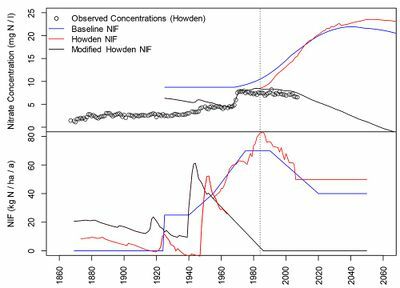 It can be observed that using the Howden NIF, the observed trends in riverine nitrate concentrations are well replicated to approximately 1984. The timing and magnitude of the increases in nitrate in the 1950s and 1970s are well matched by the model (R2 = 0.79, Nash and Sutcliffe Efficiency (NSE) = 0.53). Following 1984, monitored nitrate concentrations in the Thames stabilise and begin to decline. Figure 3.5 Observed and modelled nitrate concentration in the Thames at Hampton using the BGS nitrate model: a) with changes to the NIF; b) the different input functions. 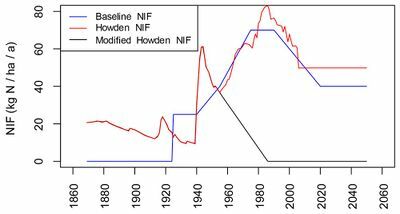 However, both the original and Howden NIF show large increases in nitrate loadings between 1970 and 1990. These increases in nitrate loading are reflected in the model output by the large increases in modelled nitrate concentrations from 2000 to 2040. Such increases are at odds with the measured declining trend on nitrate in the river. A declining NIF (black, Figure 3.5) was derived to estimate the extent of nitrate loss and attenuation likely to be required within the catchment to meet the actual nitrate concentration trends. The resultant model nitrate concentrations match the observed concentrations for 1980 to 2000 reasonably well although this is not reflected statistically as there is a very limited trend in the data (R2 = 0.42, NSE = -6.2). It should be noted that the declining NIF is likely to be highly unrealistic and it is likely that other catchment processes are occurring to attenuate nitrate loading in groundwater which are discussed in Implications and next steps. 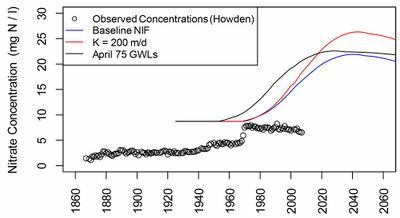 As discussed above, both the original BGS and the Howden NIF result in large increases in model riverine nitrate concentration which are at odds with observed concentration trends. Figure 3.6 shows modelled outputs and observed concentration data for sites on the Lower Thames up and downstream of Hampton at Walton and Teddington respectively. It can be observed that the nitrate concentration data at these sites match the data for Hampton reasonably well and do not show increases in nitrate concentration as predicted by the nitrate modelling. Significant reductions in model nitrate loadings are required to match the observed trends. This suggests that a number of loss and attenuation processes are likely to be occurring within the catchment. Figure 3.6 Observed and modelled nitrate concentration in the Thames at Hampton, Teddington and Walton: a) and b) using the BGS nitrate model; c) the different input functions. The work described here demonstrates clearly that the BGS model is able to replicate the results obtained by Howden if the same NIF is used. The overall travel time in the catchment is similar and shows the peaks of war activity carried through into riverine concentrations. Both models suggest that the up to the mid-1980s the observed concentrations in the Thames can be explained by assuming that it depends wholly on the input function and a delay, either empirical or taking account of modelled unsaturated travel time. This delay is in the order of 30 years. For periods after this neither model is able to replicate the observed concentrations and other factors must need to be taken into account. A number of possible processes which could affect nitrate concentrations are reviewed in the next section. The nature of the discrepancy between modelled and observed concentrations (occurring at late time in the time series, and at the highest observed nitrate concentrations) means that the processes occurring in the catchment controlling this discrepancy must be dependent on time and/or nitrate concentration. 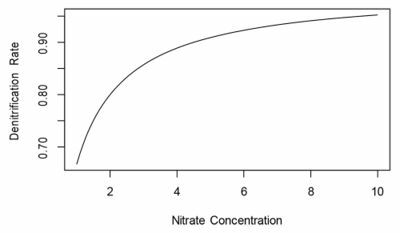 Where DNF is the denitrification rate, DNFmax is the maximum denitrification rate, [NO3-] is the nitrate concentration and K is the Michaelis constant that is the nitrate concentration (with the same units as [NO3-]) when DNF = DNFmax/2. The relationship between denitrification rate and concentration is illustrated in Figure 3.7. The reaction kinetics results in smaller increases in denitrification rate at higher concentrations. Consequently this would be of limited benefit in reducing the discrepancy between modelled and observed riverine nitrate concentrations. Any further modelling including interflow and surface flow to the Thames would encounter similar problems representing denitrification. Figure 3.7 Michaelis-Menten reaction kinetics of denitrification. It is plausible that changes in river management such as sewage treatment works discharges may be affecting river concentrations. This requires further consideration. Changes in river flows could potentially affect riverine nitrate concentrations. Under droughts nitrate concentrations in the Thames may be higher due to more baseflow contribution and less dilution by surface water. In floods more surface water flow and more anoxic conditions may dilute nitrate loadings. Figure 3.8 shows nitrate concentrations, input functions and annual average river flows for the Thames at Kingston. It can be observed that in general river flows in the Thames do not appear to be significantly higher or lower than average after 1984. Consequently, it seems unlikely that changes in river flows are exerting a significant control on riverine nitrate concentrations. Figure 3.8 The Thames at Kingston: a) observed and modelled nitrate concentrations; b) nitrate input functions; c) river flows. Since NTB itself does not produce nitrate concentration in rivers, it would be useful to couple it with river models to produce more reliable results for analysis. NEAP-N or other spatially and temporally distributed nitrate leaching data could also be used to simulate the nitrate concentration trend. Few case studies are able to test capacity of the nitrate modelling approaches to predict very long term trends as typically water quality records are not long enough. In this regard the application of the BGS model to the Thames Basin and the work by Howden is critical. The BGS model linked to a simple saturated zone model can replicate observed nitrate trends if an appropriate input function is used. This highlights the importance of the nitrate input function to the modelling approach. Both the BGS model and work by Howden use very simple transport models but can replicate observed downstream nitrate trends. This gives some confidence in the NTB model if driven by appropriate data. The discrepancy between modelled and observed nitrate concentrations at late times is not fully resolved and large increases in concentrations are predicted. Reviewing model predictions with the latest nitrate data for the Thames (2007 to 2014) may be of benefit, as would evaluating improvements in the efficiency of sewage treatment. Given the predicted increases in nitrate concentrations there is a clear need to consider lags in the unsaturated zone in the NVZ process. ↑ 1.0 1.1 1.2 1.3 1.4 1.5 1.6 1.7 HOWDEN, N J K, BURT, T P, WORRALL, F, MATHIAS, S, and WHELAN, M J. 2011. Nitrate pollution in intensively farmed regions: What are the prospects for sustaining high-quality groundwater? Water Resources Research, Vol. 47, W00L02. ↑ NRFA. 2014. Thames at Staines — Daily Flow Data. CEH. Wallingford, National River Flow Archive. ↑ WANG, L, STUART, M E, BLOOMFIELD, J P, BUTCHER, A S, GOODDY, D C, MCKENZIE, A A, LEWIS, M A, and WILLIAMS, A T. 2012b. Prediction of the arrival of peak nitrate concentrations at the water table at the regional scale in Great Britain. Hydrological Processes, Vol. 26, 226–239. ↑ 4.0 4.1 4.2 HOWDEN, N J K, BURT, T P, WORRALL, F, WHELAN, M J, and BIEROZA, M. 2010. Nitrate concentrations and fluxes in the River Thames over 140 years (1868–2008): are increases irreversible? Hydrological Processes, Vol. 24, 2657–2662. ↑ WANG, L, STUART, M E, LEWIS, M A, WARD, R S, SKIRVIN, D, NADEN, P S, and COLLINS, A L. 2016. 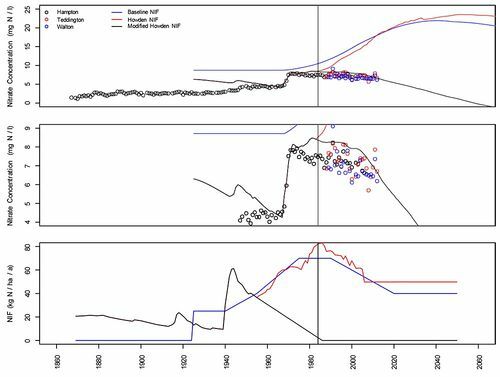 The changing trend in nitrate concentrations in the major aquifers due to historical nitrate loading from agricultural land in England and Wales. Science of the Total Environment, Vol. 542, 694–705. ↑ LEWIS, M A, JONES, H K, MACDONALD, D M J, PRICE, M, BARKER, J A, R, S T, WESSELINK, A J, and EVANS, D J. 1993. Groundwater storage in British aquifers: Chalk. National Rivers Authority R&D Note, 169. ↑ RIVETT, M O, SMITH, J W N, BUSS, S R, and MORGAN, P. 2007. Nitrate occurrence and attenuation in the major aquifers of England and Wales. Quarterly Journal of Engineering Geology and Hydrogeology, Vol. 40, 335–352. ↑ 8.0 8.1 BOYER, E W, ALEXANDER, R B, PARTON, W J, LI, C, K., B-B, DONNER, S D, SKAGGS, R W, and GROSSO, S J D. 2006. Modeling denitrification in terrestrial and aquatic ecosystems at regional scales. Ecological Applications, Vol. 16, 2123–2142.